X rays are electromagnetic waves in the 10 -8 to 10 -11 meter (3 × 10 16 to 3 × 10 19 Hz) range of the spectrum. (Alternatively, x rays can, like all electromagnetic waves, be conceived of as particles termed "photons.") Because x rays have more energy than visible light, they can pass through solid objects that are otherwise opaque. However, they do not, in general, pass through them as if they almost transparent, as air is to visible light; rather, when x rays encounter materials of different densities and compositions, they are absorbed and deflected from their original straight-line paths (scattered) to different degrees. This allows x rays to be used for imaging the interiors of many objects. The two commonest commercial applications of x-ray scanning technology are medical imaging of the interior of the body and security scanning of baggage and cargo. Projection radiography. Projection radiography (also termed transmission imaging or fluoroscopy), discovered in 1895, is the oldest and simplest form of x-ray scanning. In projection radiography, a beam of x rays is directed at an object behind which a detector or x-ray sensitive surface (i.e., electronic-device array or photographic film) is placed. Volumes of different absorptive properties in the object absorb and scatter the incident x rays to different degrees, causing an x ray shadow to be cast on the detecting surface. This shadow pattern is the x-ray image. 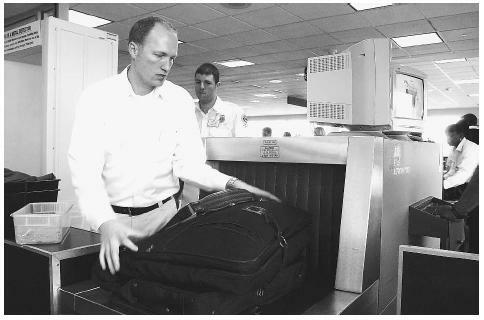 A Transportation Security Administration screener, left, loads luggage into an x-ray scanner at the Bismark, North Dakota, airport. More than 30,000 new Security Administration employees were hired for increased airport security screening since the September 11, 2001, terrorist attacks on the World Trade Center in New York. infants are especially vulnerable to all ionizing radiation, including x rays. Computed tomography. Computed tomography (CT, also known as computerized axial tomography, CAT) was first made commercially available in the mid-1970s. CT combines projection radiography with computer processing to recover the three-dimensional information that is lost in a traditional two-dimensional x ray. In a CT scanner, the object to be scanned (e.g., person or baggage item) is placed in a cylindrical or doughnut-shaped device. Inside the cylinder or doughnut is an x-ray source that is mechanically rotated entirely around the object. Also, the cylinder or doughnut is lined with detectors that measure the x rays that pass through the scanned object at all angles. By collating all the information that is gathered during a full revolution of the x-ray source, a computer can form a three-dimensional model of the irradiated volume of the object. This information can then be presented to the user on a video screen in any desired form; most commonly, a thin slice of the object is modeled, with the details of its structure imaged as a black-and-white cross-section. To examine more of the object, the user looks at multiple slices. CT scanning provides information not only on gross structure but on material density. In medical applications, this enables it to image soft tissues far better than conventional x-ray systems. In some security CT systems, the scanner's computer can automatically color-code densities characteristic of explosives or other special substances. CT scanning is computation-intensive and requires rotation of the x-ray source around the scanned object, making this technique slower and much more expensive than transmission-type imaging. However, because CT images not only the geometry but the density distribution of complex three-dimensional structures, including (potentially) explosives shaped into thin sheets and other devices structured to avoid detection, most U.S. airports have one or more CT scanners. Since it is not practical to put all bags through the CT scanner, only selected or "suspicious" bags (e.g., those belonging to a passenger who pays cash for a one-way ticket) are passed through the CT scanner. Technological improvements in CT scanning are likely to make routine CT scanning of all luggage, with automated computer scanning for weapons or contraband, a reality at airports in some wealthy countries. Backscatter imaging. "Backscatter" consists of waves that are reflected back from an obstacle. In backscatter imaging, x rays are beamed at a target object and a sensor co-located with the beam source records reflected (backscattered) waves. Since denser objects tend to create more backscatter, backscatter x-ray systems create a density-contrast image that reveals different information about objects' interiors than does transmission imaging. Because transmission imaging and backscatter imaging can provide complementary information, relocatable military xray systems designed to inspect entire cargo containers, trucks, helicopters, and the like (e.g., the U.S. military's Isosearch system) acquire both transmission and backscatter images. Backscatter imagers for personnel have also been constructed. A typical walk-through backscatter x-ray system can see what is beneath a person's clothing—including the person. Although this is useful for detecting hidden weapons, it also raises obvious questions of privacy and legality where use on the general public, such as in airports, is proposed. There are also, as with all x-ray imaging modalities, health concerns. Although a walk-through of a backscatter imaging system would expose a person to only about 1/7,000 of the dose of a conventional medical x ray, some health physicists argue that frequent flyers and women who are pregnant but do not yet know it might still receive unacceptable cumulative doses from backscatter systems. (High-altitude air travel already increases a traveler's exposure to x rays from space.) Backscatter x-ray systems have been deployed since the late 1990s in a few prisons as alternatives or aids to frisking, and have been found effective. Stereoscopic x-ray screening. Using specially-constructed sensors it is possible to acquire transmission-type x ray information that can be formed into stereoscopic images (that is, a left-eye, right-eye image pair that the user's brain combines into a three-dimensional impression). Because such an image has apparent depth but cannot be rotated, it is sometimes referred to as "2 1/2 dimensional." Stereoscopic x-ray technology is only a few years old, but may eventually replace conventional two-dimensional baggage scanners in airports because it provides the operator with additional visual-recognition cues that should increase their chances of correctly identifying weapons. Furthermore, stereoscopic x-ray scanning is quicker and cheaper than CT scanning, as it requires less computation and does not need to rotate the x-ray source around the object being scanned. Its limitations are that it provides neither fully rotatable three-dimensional knowledge of an object nor density data, both of which are provided by CT scanning. Coherent scattering. The atomic orderliness of a substance affects the way in which x rays are diffracted (i.e., forced to mutually interfere) when passed through it. By recording the scattering patterns characteristic of specific compounds (e.g., drugs, explosives), and comparing these templates to patterns observed when scanning objects, a substancespecific detection system can be devised. This technique is now in the early development stage, and is not ready for deployment. Other imaging modalities. Several other techniques for imaging object interiors exist, including ultrasound, positron emission tomography (PET), nuclear magnetic resonance (NMR) imaging, nuclear quadrupole resonance (NQR) scanning, and neutron emission analysis. All, like xray scanning, have security, medical, or scientific applications; the question of which technique is best for any given application is decided based on physics (i.e., which imaging modalities can do a particular job) and, if more than one technique is usable for a given task, on economics (i.e., which imaging modality yields the minimum acceptable image quality for the least cost). For enhanced efficacy, airport security systems are now being planned that will combine complementary techniques to increase the probability of weapon or contraband detection. Such a system might combine x-ray scanning for suspicious-object detection with neutron emission analysis for chemical identification. Bruning, Horst, and Stephen Wolff. "Automated Explosive Detection Systems Based Upon CT Technology." Security Technology 1998. Proceedings., 32nd Annual 1998 International Carnahan Conference on. Oct. 12–14, 1998: 55–58. Evans, J. P. O., M. Robinson, and S. X. Godber. "Pseudo-Tomographic X-Ray Imaging for Use in Aviation Security." IEEE AES Systems Magazine July, 1998.